Today we had an outing, the two ducklings and me. We went all the way into our backyard. There I let these two little ones forage. 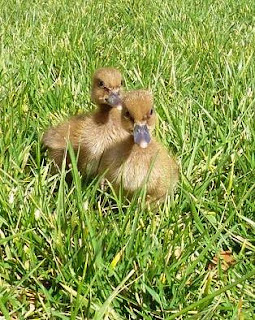 Watch out, Agoura Hills, here come the two free ranging ducklings. They were picking all sorts of things, including some brassica seedlings. Ah well. One of them is much bigger (not sure it is politaclly correct to say fatter?!) than the other one. I really think, I need to separate fatty for the next meal. When they were done munching, they sat in the sun. Ahhh! Soaking up those rays ... NICE. At some point big duck tried to scratch her head with her big webbed duck feet and wham! fell straight onto her feathered behind. Too funny. Eventually, I went inside to get some water and guess what: There was a loud protest peeping and when I turned around to check what had happened to them, I realised they were running after me. Feels great to be stalked by such cute little feather-balls. Although, now wherever I go, I need to watch out not to step on one or both of them. Born too late to be Mother Goose, but u'll have to start your book of children's sayings - Mother Duck! How do u get anything done - they're both too cute! BTW - Test out the solar oven yet? They are really cute and I have to admit, last week we were all constantly sitting next to them. Aurelia wants to take them to the golf course in the waggon ... I explained that they can come with us once they are fully feathered so they can hop into the creek / pond.